(CNN) -- The pope has admitted making mistakes over the lifting of the excommunication of a Holocaust-denying bishop, saying the church will make much greater use of the Internet in the future to help avoid such controversies. 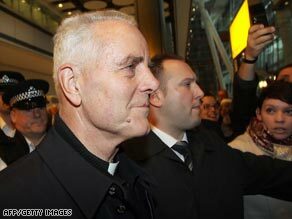 Pope Benedict XVI has admitted making mistakes over Bishop Williamson's, pictured, return. In a letter to church leaders, Pope Benedict XVI says the church should have been aware of the views of Bishop Richard Williamson. "I have been told that consulting the information available on the Internet would have made it possible to perceive the problem early on. "I have learned the lesson that in the future the Holy See will have to pay greater attention to that source of news." Williamson, an Englishman, hit the headlines partly because the pope lifted his long-standing excommunication, along with that of three other members of the ultra-conservative Society of St. Pius X. Before the pope's decision, Williamson said in an interview with Swedish television that he did not believe that Nazi leader Adolf Hitler deliberately set out to murder Jews or that there were gas chambers at the Auschwitz death camp. The church said Benedict was not aware of Williamson's views on the Holocaust when the excommunication was lifted even though it was widely available on the Internet, and ordered Williamson to recant. The pope admits in his letter that the affair had taken him by surprise, with something that was meant to be a gesture of Christian unity becoming misrepresented. He "deplored" the upset peace between Christians and Jews caused by the row, but also queries whether the Society of St. Pius X should have been left to drift away from the Church. And stung by criticism from fellow Catholics, the pope says he was "saddened" by the hostility of the attacks on him. However, he thanks the "Jewish friends" who helped "re-establish an atmosphere of friendship and trust."